Heat garlic with cooking spray in a medium sauté pan over medium heat. Cook until soft but not browned. Add onions, and continue to cook until the onions are soft but not browned. Add spinach, and toss gently. Cook until the spinach is heated throughout. Season with pepper, and set aside to cool. 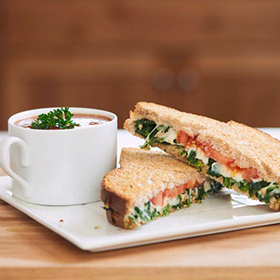 When the spinach and onions are cool, assemble each sandwich with one slice of bread on the bottom, one tomato slice, 1/2 cup of spinach mixture, 1/4 cup of cheese, and a second slice of bread on the top. Spray the preheated nonstick baking sheet with cooking spray. Place the sandwiches on the baking sheet. Bake for 10 minutes or until the bottom of each sandwich is browned. Carefully flip sandwiches, and bake for an additional 5 minutes or until both sides are browned. Serve immediately. Serving size: 1 sandwich. Amount per serving: 254 calories, 8g total fat (4g saturated fat), 29g carbohydrates, 17g protein, 6g total fiber, 468mg sodium.